These concerns have been driven by some visible problems. Young people have experienced the biggest pay squeeze in the aftermath of the financial crisis, seen their dreams of home ownership drift out of sight and witnessed a welfare state in retreat. No doubt some of these strains on the intergenerational contract are short-term in their nature and will unwind naturally over time, but there is a sense that many of them run deeper. In this document, which marks the launch of the Intergenerational Commission, we dig deeper into some of the experiences of younger generations to identify both reasons for optimism and causes for concern. In doing so, we establish a framework for thinking about intergenerational issues and highlight the scope for policy to make a difference. 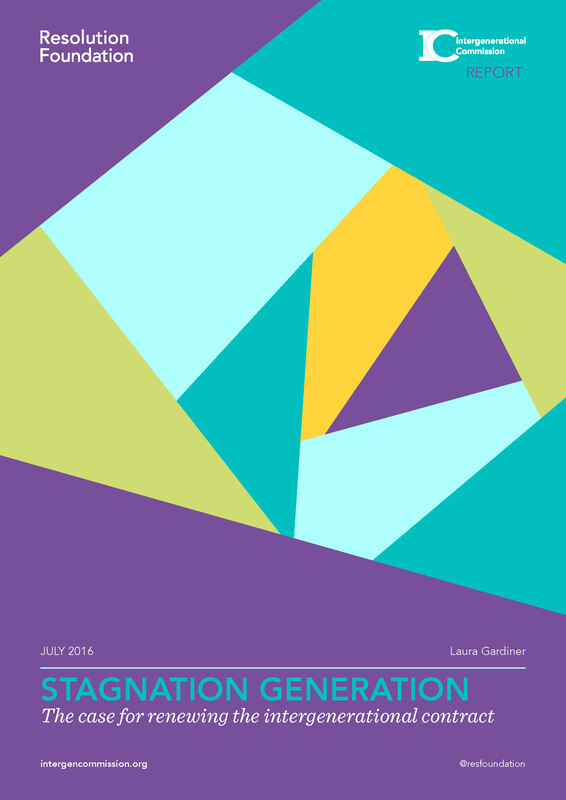 The microsite for the Intergenerational Commission is here. Millennials are at risk of becoming the first ever generation to record lower lifetime earnings than their predecessors: In contrast to the taken-for-granted promise that each generation will do better than the last, today’s 27 year olds (born in 1988) are earning the same amount that 27 year olds did a quarter of a century ago. Indeed, a typical millennial has actually earned £8,000 less during their twenties than those in the preceding generation – generation X. Lower levels of home ownership among younger generations generate short-term disappointment and longer-term living standards challenges: A baby boomer at age 30 was 50 per cent more likely to own their own home than a millennial at the same age. The redistributive welfare state is key, but too little consideration is given to how this plays out across generations: The tax and benefit plans the new Prime Minister and Chancellor have inherited will take £1.7 billion from millennials while giving away £1.2 billion to the baby boomers in the next four years. These may be legitimate choices, but too little debate in this area means we are blind to the generational fairness or otherwise of such decisions. Renewing the intergenerational contract is a shared challenge for our times: For all the talk of generational war, people whatever their age share concerns for the fate of the next generation – for their children and grandchildren. We’ve seen big increases in support for house building right across the generations, with more than half of baby boomers now supporting more house building in their local area.